I really like this cologne and enjoyed the many compliments. Recently, Eternity Flame for Men came out and it is very similar with a better longevity. EMPORIO ARMANI STRONGER WITH YOU Is a real good fragrance that last a long time . Armani stronger with you , is by far the most sexiest Cologne For men in my book I bought it for my husband it last all day even when he’s been working all day . It is strong when you first spray it but give it 15 -20 mins it wears on nicely.... There’s no floral in this it’s a Manly man Sent . 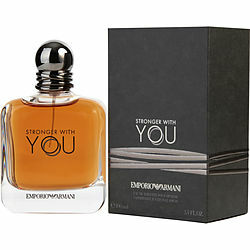 Stronger with you by Armani is a sure keeper has a great opening and very sweet but masculine. I just love wearing it and recommend it a lot.